Until a few decades ago, the small village of Plakias (about 500 inhabitants) was a small fishing village with about five houses. It lies on the south coast of Crete in a large valley. Here often a stronger wind blows than in other places of Crete, which can be quite pleasant in summer. Since the first hippies appeared there at the end of the 60s, the place has grown strongly. Today the village consists of more than 100 houses. I came to Plakias for the first time about 20 years ago. As an old fan of Greece I already knew after a few days that this could be the place I was looking for. At that time I was looking for a second home in Greece. 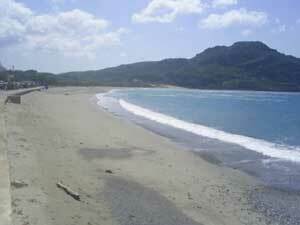 A 3 km long sandy beach is directly in the village. In addition there are still some smaller, beautiful and lonely beaches in the closer environment. Behind the place the nature begins immediately. Plakias is framed by a landscape of mountains. Above Plakias there are the mountain villages Sellia, Mirthios and Mariou. These can each be reached by a short hike or of course by car. The tourists in Plakias are mostly individual tourists. There are fewer package tourists here, although the number is increasing, as everywhere in Crete. In Plakias about 50 Germans and other Northern Europeans have found a new, permanent home. As with many of them, my first place of residence in Plakias was the youth hostel. A great community of several 100 people, who know each other and come back every year, many for several months, has come into being in the youth hostel (among us we simply call it a hostel). Some of them now live entirely in Plakias. This is mainly thanks to the English hostel manager and convinced emigrant Chris. Unfortunately Chris died much too young in 2012 due to a traffic accident in his beloved Plakias. Currently (at the beginning of 2019) Uli from Berlin continues to run the hostel in the style of Chris. One overnight stay costs only 10 Euro in 2019, who stays longer than one week gets an even cheaper price from Uli (about 9 Euro per overnight stay). Although I now have my own rented apartment in Plakias, I'm still at the hostel every day when I'm in Crete. Who wants to meet me there: ask for Jorgy. We play chess almost every morning in the youth hostel. Players are always welcome. By the way, the youth hostel is not only popular with young people. Many of the regular guests have been over 40 years old, not a few even over 60. I my life I was already in many hostels around the world, the one in Plakias is still the best and most beautiful. Uli from Germany runs the youth hostel Plakias excellent. More information and a booking possibility for the youth hostel Plakias can be found here. 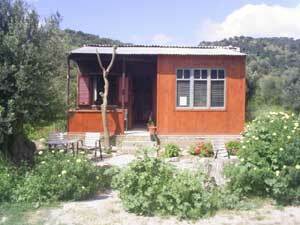 If you are looking for a nice holiday flat in Plakias, I can recommend Plakias Hill "Koulés". If someone in Plakias asks us for a nice and cheap room, we often recommend the Hotel Sofia. Hardly any hotel in Plakias has more regular guests. A room with breakfast costs less than 40 Euro for 2 persons outside the peak season. The nice rooms, the nice owners and the breakfast that is usually included in the overnight price in the Sophia Hotel Plakias are always praised. The location is perfect. The accommodation is in a quiet side street. The town centre, the bus stop and the beach are only a 3 to 4 minute walk away. The Secret Nest is similarly quiet and very inexpensive. There are rooms with and without kitchenette. Air Condition, bathroom and balcony all have. Here you can get a double room, depending on the season, already for less than 30 Euro. The Hotel Livikon is our recommendation on the lively lakeside road, the main street of Plakias. There are rooms with view to the front (sea view) and to the back (mountain view). Some of the well-kept rooms have an integrated small kitchen. TV, air conditioning, bathroom and balcony are standard. The reviews about the Hotel Livikon are consistently very positive. If you have a little more money and are looking for a hotel with a high standard in Plakias, you could find your holiday happiness in the Alianthos Garden Hotel. A huge breakfast buffet is served here. Good swimming pool, cocktail bar, buffet restaurant and much more. Plakias Resort is the largest resort in Plakias that has been newly built in recent years. You can find apartments in any size from a studio with 40 m² to a villa with more than 100 m² and 3 bedrooms. Plakias Resorts is a high-quality resort with the best reviews. It has a children's playground, a large pool with bar and much more. The sea is only a few meters away, the centre of Plakias a few hundred meters. The successful design of the Plakias Resort and the modern residential units are praised again and again. The well-trained staff tries to fulfill every wish of the guests. We start our tour through the taverns of Plakias at the beginning of the village to the big supermarket at the two Alianthos hotels. In Alianthos Garden and Alianthos Beach there is a buffet for the hotel guests every evening during the season. Non-guests are welcome to eat. In 2015 I tried the buffet at Alianthos Garden. The buffet tasted excellent and was very varied. For only 10 Euro plus drinks it was a real bargain. In Alianthos Beach I tested the breakfast buffet. For about 6 Euro a lot was offered and the drinks were included. Again a great bargain. Next, if you walk along the main road along the sea, you come to Kima (also written Kyma). This is where football fans meet. All Bundesliga matches are shown live. In addition there is cold beer from the barrel as well as snacks such as toast and hamburgers. Greek main courses, such as gyros, are also offered at reasonable prices. There are several television sets in the Kyma, often several football games run parallel. The Candia offers good coffee and cake from morning till evening. The take-away cheese and spinach bags are ideal for a delicious breakfast on the hotel balcony. Everyone in Plakias knows the Souvlaki grill Xechoristo. The gyros pita is delicious and costs 2.50 euros, as are the other pitas with souvlaki, minced meat or chicken. Those who like meat and are very hungry should try the gigantic, mixed grill plate. For less than 8 Euro everybody will be satisfied. This restaurant Xechoristo is also open in winter. In summer there is no rest day, in winter it is usually closed on Mondays. The Lysseos is known for good, fresh food. It has many regular guests. A friend of ours goes here almost every day and every year for months. In the Harakas the wife of the owner comes from Switzerland. Whether German, English, French or Spanish, one is understood. The daughter is also a true language talent. The cuisine is consistently good, we love the spaghetti with seafood. In Kri-Kri there have been the best pizzas in Plakias for many years. They are expertly prepared in a large stone oven. In summer, all the tables in the large tavern are often occupied. This is probably why the Kri-Kri tavern has been considerably enlarged for the 2016 season. Sifi´s is at the central square in the heart of the village. It is one of the few restaurants in Plakias that is also open in winter. Sifi is always in a good mood and serves mainly Greek meat dishes in large portions. The plates for 2 or 4 persons including many starters and wine make every hungry holidaymaker happy and full. From time to time there is Cretan live music with dancing until the morning at Sifi in the tourist season. In the Korali (also Corali) there is classical, Greek kitchen of high quality. One sits directly at the sea. The staff is available for everyone to have fun. The fish is caught by the owner family themselves. Sofia is one of the oldest taverns in Plakias. As in neighbouring Gorgona, Greek dishes are served, including good starters. One sits also in these two restaurants directly at the sea. The next Mousses restaurant has perhaps the largest menu in Plakias and is very inexpensive. At Christos in the harbour there is fresh fish from the sea off Plakias. One sits almost directly at the water. Christos is one of the highest quality fish restaurants in Plakias and makes a very clean and tidy impression. In the same building complex is the always well-attended Gio-Ma. One sits very romantically at the sea and enjoys among other things good salads, fish and meat dishes. It is a very popular tavern among the regulars of Plakias. Now you go around the right bend, further along the sea. In the curve is Atlantis, a very tasty fish restaurant of the upper class with good, inexpensive offers. The Tasomanolis also serves excellent fresh fish. No wonder, it is a long-established fishing family in Plakias. In the fish tavern Tasomanolis we already ate well 25 years ago. The Sirocco changed hands a few years ago. Before and after it is one of the best taverns in Plakias. We're still in the street along the sea in Plakias. After a left turn we reach the last tavern. Here the old saying "Last but not Least" applies. In the Apanemo there are gigantic meat dishes directly from the grill for 6-8 euros. French fries and lots of salad, as well as the legendary Apanemo garlic bread as a starter are already included in the price. Cheap, plenty and tasty! 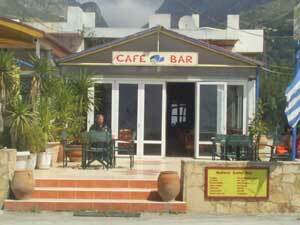 Of course, there are also taverns and restaurants in Plakias that are not on the promenade. Let's start in the street that goes away from the sea at Sifi. There are no street names and house numbers in Plakias, otherwise I would mention them here. The good, old Kafenio offers traditional Cretan, down-to-earth and inexpensive food in a good atmosphere. Here it is not uncommon to just drink something, such as an ouzo, a glass of wine or a cool beer. You can also order a meze, a small snack. On the other side of the street is the Tavernaki, some also say Minoiko about this restaurant. Also here you can eat good and cheap Greek. We like to go here and often. As in many Tavenas in Greece, you can order 2-3 spits instead of a main course. The Tavernaki, for example, has a delicious beetroot salad with walnut as a small dish. Also the big salad with figs is great. Seen from the hostel it is the first tavern if you cross the bridge towards the sea. I will not forget my friend Manousos and his tavern of the same name. He is always in a good mood, his mousaka and his grilled chicken are real culinary highlights. You find him at the very beginning of Plakias, behind the Alianthos Beach Hotel 50 meters west. These are not all taverns in Plakias yet. There are many more, even those that are good and should be mentioned here. Enjoy your meal! After the meal there is in almost all taverns a Raki for free, in not few taverns a whole carafe Raki is put on the table. Now it is at 22 o'clock, sometimes even an hour later. Time for the pubs and clubs in Plakias. In the surroundings of Plakias there is one thing above all else: olive trees. The olive oil from the region is very much appreciated by many regular guests, not a few take every year one or more canisters home with them. Many connoisseurs say that the oil around Plakias is the best olive oil in all Krea or even the whole world. For some time now you can also order the great olive oil from Plakias in England, for example at Amazon. After dinner, the Nufaro bar (Joes Bar) is the meeting place for the hard-boiled drinkers and party fans from the youth hostel. The owner Joe serves strong drinks with good music until the early morning. A Raki costs one Euro, a big beer 3 €, a long drink (strong drinks!) 4-5 €. Good alternatives are the bars Ostraco and Smirna, both open until morning. On the first floor of the Ostraco there is dance music with music videos on a big monitor. You can see and be seen on the legendary balcony. Smirna is a classic bar with always well laid out staff and a long counter. "Nikos on the Rocks", at the end of the village next to the tavern Apanemo, is a meeting point for the many Germans in Plakias. Compared to the Nufaro or Ostraco, it is rather quiet here. Nikos on the Rocks is a good bar for chatting, whether with beer in the evening or with coffee or Cretan mountain tea during the day. In summer Plakias can be reached about 5 times daily by bus from Rethymnon. From October to mid-May (winter timetable) there are only 2 buses per day. If you want to go to Agia Galini, Spili, Festos or Matala, you have to change at Koxare. This is only possible in the summer timetable without very long waiting time with 1-2 connections per day. You can ask the bus driver or at the hostel. Buses to Frangokastello and Chora Sfakia are no longer available. If you want to go from Plakias to Sfakia, you have to change twice in Rethymno and Vrises. The fare is 5.00 euros (as of January 2018), the journey time of the buses is about 50 minutes, with little traffic in winter a few minutes less. The bus from Plakias to Rethimnon at 15:15 goes through the villages of Mirthios and Mariou. There are no buses to Selia from Plakias, from Rethymno there is a bus to Sellia at about 14:30. The above buses stop in the villages Asomatos, Koxare and Armeni, as well as almost all in Lefgogia. From May to October, buses also run from Plakias to the beach and Preveli Monastery. It is to be expected that the timetable will change little in the 2018 season and 2019, at least the changes in the last 4-5 years have been small. Plakias - Preveli: 10 o'clock, 11 o'clock, 12 o'clock and 18 o'clock. The return journey is half an hour later. A single ticket costs 2,30 Euro. The bus to and from Preveli is the minibus which is next to the bus stop. It goes first to the beach and then to the monastery. To the Preveli Beach you have to walk for about 20 minutes (many steps, not suitable for people with walking disabilities and extremely unathletic people). Outside these months there are no buses to Preveli. But you can take the bus from Plakias to Rethymno and get off at an intersection after the village of Lefkogia. After that you have to walk about 5 kilometres. All tickets can be bought on the bus. If you get on in Rethimno at the bus station, you have to get a ticket at the ticket counter. There are return tickets, but they make little sense as they are not cheaper than two single tickets. The timetable did not change in 2018. From Rethimno take the main road towards Spili, Agia Galini and Timbaki south to reach Plakias. There are two ways to turn right from this road. Both roads are interesting. The first turn-off, about 20 km after Rethimno, goes over a road to Plakias, which was only built in 2015. The signpost on the main road shows Selia and Chora Sfakia, but not Plakias. After Kanevos the road leads through a short gorge. Shortly after, there is a turn-off to Mirthios and Plakias (signposted). In the mini village Kanevos (about 10 houses) is a very good and inexpensive tavern. One can go in the Taverna Iliomanolis still like in former times into the kitchen and look at the meals (main courses mostly 4 to 7 euro). The second turn-off from the main road is only about 2 km after the one described above. Plakias is signposted here. The passage through the Kourtaliotiko gorge is a great experience. Most holidaymakers stop to take pictures. In summer these are so many that even a snack car offers small meals and drinks. We continue through the villages Asomataos and Lefkogia to Plakias. Both alternatives take about the same time. The journey time from Rethymno to Plakias is about 40 minutes. From Hora Sfakion take the road to Chania and after 2 km turn right towards Frangokastello. After about 50 minutes you reach the village of Selia. From there Plakias is signposted (another 10 minutes). On the way you can make a detour to the beach at Rodakino. Here you will find about 5 taverns and a beautiful environment. It is only about 2 km from the main road down to the beach. 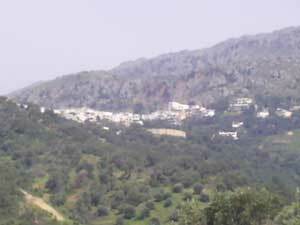 The village Mirthios: This is small mountain village (180 m above sea level) and is 2 km from Plakias. The small hike from Plakias to Mirthios should be combined with a visit to a restaurant. The three best restaurants of the area are located here. In the panorama, one gets an excellent mixture of Cretan, German and vegetarian dishes. You should definitely try the starter plate that you can put together yourself. In Platia, the village owner cooks the best Cretan food in the area. The tavern Dionysos, sometimes simply called "Taverna Mirthios", is for many regular guests the best tavern in the whole area of Plakias. It has even received several awards in recent years. Salad Dionysos" is for me the best salad on the whole island. It consists exclusively of local ingredients, some of which are quite rare. All three taverns in Mirthios have a good view, whereas the Platia and the Panorama have perhaps the most beautiful view of all taverns in Crete. One has a wonderful view of Plakias, the surrounding mountains and the sea in different shades of blue. That's why you should visit Mirthios before sunset, or even better at sunset. The taverns have become so popular that up to 100 parked rental cars line the main street in the evening during the high season. Mirthios connections: The only bus on the day from Plakias to Lefkogia leaves at 15:15. A taxi from Plakias to the mountain village costs about 6 to 7 euros. This is cheaper with 4 persons than the bus. 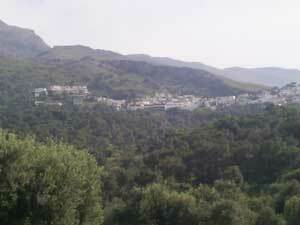 The village Selia: Also a mountain village (260 m altitude) about an hour walk from Plakias. Here tourism has been overslept a bit and the village has kept its originality to a large extent. Also the taverns remind of past times. Interesting is the cheese dairy with an attached shop. Here one can buy delicious, fresh cheese cheaply. There are several beautiful hiking trails from Plakias to Selia. There are no buses between Plakias and Selia. A taxi costs about 8 Euro. The village of Mariou: This village has remained very Cretan because it is a little off the beaten track. There are 2-3 small kafenions where you can get in touch with the locals. Meanwhile Mariou also has a great, bigger tavern with very nice owners and delicious, fresh dishes from the Cretan kitchen. Das Dorf Asomatos: In diesem Dorf gibt es ein kleines, lustiges Museum des ehemaligen Dorfpriesters. Er sammelte einfach alles was finden konnte. Sehenswert! 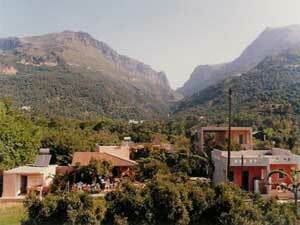 The village Lefkogia (also Lefkoyia): A village about 5 km east of Plakias. Some simple taverns, starting point for hikes on Timeos Stavros. You can go by bus or car through Lefkogia if you go to Plakias on the main route. The food at Stellios (delicious, local meat dishes) is very good and typically Cretan. Moni Preveli Monastery: A monastery about 12 km from Plakias. You can visit the monastery where monks still live. It is one of the most famous monasteries in Crete. In summer about six buses a day from Plakias to Preveli. You can travel one way by bus and the other from or to Plakias. Since 2015 you can also visit the old monastery of Preveli again. One is to the left of the road to Preveli. Damnoni beach: This was once the most beautiful beach in the Plakias area (about 3 km away). However, more than 20 years ago a large time-sharing hotel of the Hapimag chain was built. Some taverns, pensions, a car rental etc. are a few meters behind the beach. Perhaps the most beautiful beaches around Plakias are right after Damnoni: The Bay of Pigs and One-Rock. If one goes further, after a few minutes one reaches the right beautiful Amoudi Beach (tavern and room rental). Another 20 minutes walk to Skineria Beach. From there you can continue on a road to Lefkogia (about 4 km). The beach Souda: About 4 km west of Plakias, about 10 houses, many more buildings scattered in the area. It is a beautiful beach, a cool stream flows into the sea at the end of Souda Beach. Several taverns and hotels. If you cross the stream and climb the rocks (not without danger), you will find a path at the top that leads to Rodakino (about 3 hours). As the road to Rodakino is rather flat, one can easily cycle between Plakias and Souda. A little further (about 25 km) it is to the new, gigantic reservoir Potamon. Climbing Timeos Stavros (about 2.5 hours from Plakias or 1-1.5 hours from Lefkogia). At the summit there is a small chapel, there is a visitor's book (summit book). One has a magnificent view of the surroundings of Plakias, Mount Ida (the highest mountain in Crete) and the White Mountains. In the distance you can see the island of Gavdos on a clear day. You leave Lefkogia in southern direction and walk around the mountain. At the back of the mountain, a signposted path leads to the summit (about 430 metres above sea level). You can take one of the buses from Plakias to Rethimno and get off at Lefkogia. Attention: the bus at 15:15 does not go through Lefkogia. From Lefkogia one first goes to Gianiou, a small village worth seeing that still looks quite original. One has the feeling that the tourism in the area has forgotten this village. In the village there is a signpost to the monastery Preveli (see above). From there you can walk to the famous palm beach of Preveli. Plakias - Lefkogia a good hour, Lefkogia-Gianiou max. 1 hour, Gianiou - monastery Preveli about 30-35 min, monastery Preveli - beach Preveli about 45 min. The tour is also possible by bicycle. After Mirthios: Leave Plakias and head north past the hostel. After about 800 metres you pass through the river and continue to the old mill (worth seeing, Venetian water mill from the 16th century). From there a small path leads through dense bushes to Mirthios (1.5 hours in total). Return on a normal steep dirt road to Plakias (20-30 min). Long trousers recommended for the way there (thorn bushes). The way is not easy to find. The manager of the hostel will be happy to help. Frati Gorge: A difficult and dangerous but very interesting hike. It is best to take the bus from Plakias to Rethimnon and ask the bus driver to stop at the turnoff to Frati shortly after the imposing Kourtaliotis Gorge. From the turnoff, climb steeply up the road to the village of Frati (about 1 km) and then behind the village on a goat path through the gorge. A head for heights and hiking experience are required. This is the most scenic hike in the area. It is best to ask at the youth hostel for a detailed description of the route and its condition. The tour is not possible after earthquakes, landslides or bad weather (wind). 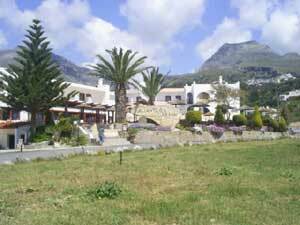 Plakias Hostel is one of the best and most beautiful hostels I know. The individual bungalows, each with 8 beds, are located on a large green property. The several kilometres long sandy beach of Plakias is one of the most beautiful in Crete. In the low season the beach is almost deserted. 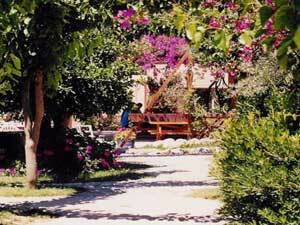 The two hotels of Alianthos are one of the few package hotels in the Plakias region. Most of the tourists are individual tourists. 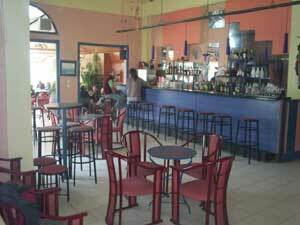 Joes Bar (real name: Nufaro) is the bar in the meeting place for the inhabitants of the youth hostel of Plakias. Coffee is served during the day, Gin Tonic and Raki at night. The Plakias Library is a non-profit project of some British people who emigrated to Plakias. The books (several thousand) are donations only. It is very popular with holidaymakers. Most of the books are in English and German. 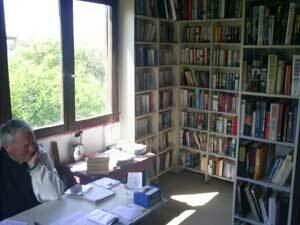 In the meantime, the Plakias library has moved to another, larger building. View of Mirthios from Plakias. In about 30 minutes you can walk from Plakias to Mirthios. In Mirthios there are the best taverns around Plakias. Selia is about an hour's walk from Plakias. Selia has remained very pristine despite the many tourists in the area.